Dust off your Vinyl Records and safeguard your recordings! RIP Vinyl records from any audio input on your PC, and produce WAV or MP3 files, which can then be put onto a CD-R, iPod, or other portable music player for your own personal use while away from home. Compression is done via Microsoft's Audio Compression Manager (MSACM) and can use any ACM codec that is licensed for encoding. The software automatically detects tracks while recording, and can record 78 RPM records on a 45 RPM turntable. 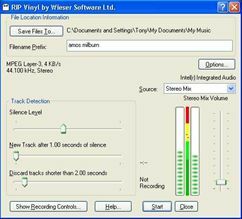 You can also Record Streaming Audio if your sound card supports it, and on Vista, record anything that's playing back. The software now supports a peak VU meter, and the main UI and installation has been translated into Czech, Danish, Dutch, French, German, Italian, Spanish and Swedish. You can also get help at the touch of a button. This site does not contain serial number, crack, keygen RIP Vinyl serial number : serial number is the simplest type of crack. A serial number(cdkey,product key,etc) is register the program as you may already know. a crack or keygen may contain harmful software. If you cannot find the exact version you want, just give it a try. for more information read .nfo/.txt/.diz file include in zipped file.